I have a constant struggle with the kids when it comes to mealtimes. Cameron used to be really adventurous when he was a toddler, but slowly he stopped wanting to try different foods and nowadays it is a battle to encourage the kids to have what we are having for dinner. More often than not I find myself giving in and reaching for the chicken dippers and turkey dinosaurs rather than have the arguments at mealtimes. Lately, the only way I have been able to persuade the children to try something different is by serving it up for Ed and I and allowing them to taste it from our plates. This often leads to them deciding they actually love it, and us without a dinner. 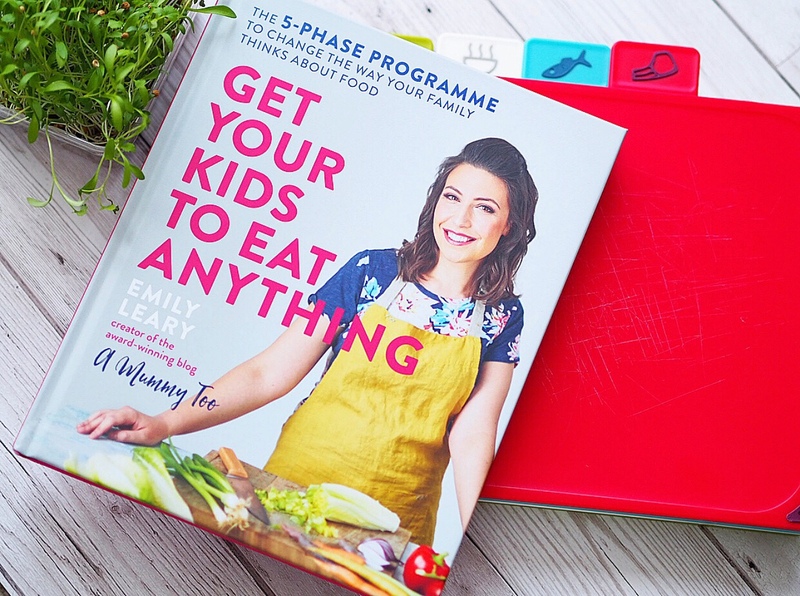 When I was offered an advance copy of fellow blogger Emily’s new cookbook, which was released yesterday 21st March and is available to buy from Amazon, I was hopeful it would work to get the kids eating different meals without the need to trick them into eating ours. The book is gorgeous, with lovely bright illustrations and I couldn’t wait to get started. The children had a look through the recipes with me and we decided on starting with the rainbow pizza and curried fish fingers and sweet potato chips. The book is divided into sections, with handy tips, meal plans and advice throughout, slowly easing families into including more and more complex tastes to kids as you go on. I absolutely love the mix of recipes. I have always been a fussy eater (I blame a diet of fish fingers and chicken nuggets as a child, sorry mum! ), and I struggle sometimes to come up with new meal ideas rather than relying on old favourites, so the book has been great for giving me new ideas as well as helping the children feel involved and excited about mealtimes. Making pizza from scratch was something I hadn’t done since I was in food technology at school, but it was actually surprisingly easy and a lot more cost effective than I initially thought it would be. Plus, the pride I felt when everybody loved my home cooked pizza was worth the worries when my dough didn’t seem to be the right consistency (turns out I just needed to leave it a little longer). Although it wasn’t necessarily as instagram worthy as the finished product in Emily’s book, I was really happy with how the pizzas turned out and the children loved them. Ed even commented we didn’t need to spend money on Dominoes Pizza anymore, so they must have been pretty good! For our second meal from the book, I wanted something which wouldn’t scare the kids off too much but would be something different for their tastebuds. I went for the curried fish fingers and sweet potato chips as it sounded yummy but would look fairly normal to the children. They hadn’t tried sweet potato fries before, so I was a little concerned how they would feel about them compared to normal chips. The kids weren’t as keen on this one as the pizza. Carly wasn’t sure about the sweet potato chips and Cameron initially thought he was eating chicken (?) but Benjamin ate his up. I think I will adapt this next time to cater for their clear lack of taste (I joke, I joke), opting for plain breadcrumbs and using potatoes for the chips. The kids were impressed that I had made the food myself, so I consider it a win. I have loved trying out some of the recipe’s in Emily’s book and am excited to work through it and get the kids, and myself, trying more meals. The book would make a lovely addition to a cookbook collection and a gorgeous gift this Mother’s Day. I was provided with a complimentary copy of the book for review. However all words and images are my own.